Two luxury wristwatches spin in an automated watch winder. Rolex Milgauss in a macro view. Rolex was founded in 1909. 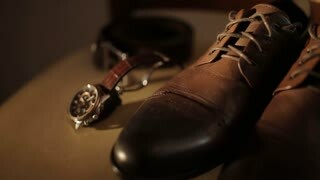 It produces about 2,000 luxury watches daily. A senior elderly woman watches TV as a hand steals a wallet from her purse. Shot in 4K UHD. UNITED STATES: 1970s: teens play basketball on outdoor court. Guy watches basketball players. 1950s: Pilot in cockpit. Plane flies in thick clouds and storm. Windshield wipers on airplane windshield. Wind blows against plane as co-pilot watches. Running athlete man looking at heart rate monitor GPS watch smartwatch. Runner running to while looking at smart watch fitness tracker in action. Athlete runner training on trail run on Hawaii, USA. Young Teenage Girl Lies in Her Bed at Night With Tablet Computer. Watches TV Show. Shot on RED EPIC-W 8K Helium Cinema Camera. 1910s: Young couple watches a movie in a theater, they watch the screen with apprehension. Movie shows woman realizing that her lover has been shot. 1910s: Young couple watches a movie in a theater, they watch the screen with apprehension. Movie shows woman crying over her dead lover. In Medical Laboratory Patient Undergoes MRI or CT Scan Process under Supervision of Radiologist, in Control Room Doctor Watches Procedure and Monitors with Brain Scans Results. 1930s: People march in parade, hold signs, smile and wave. Stalin waves at crowd, watches military parade. 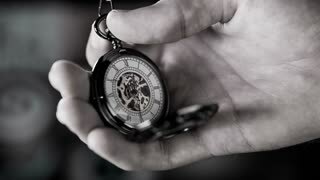 Setting Time on Pocket Watch Slow Motion Black and White. Small pocket clock in man hands close up. Extreme close-up shot of two luxury wristwatches spin in an automated watch winder. United States, 1970s: Close up of man in factory. Men works on machine. Man watches machine at work. Machine creates sparks. UNITED STATES 1960s: Man watches boy peddle stationary bike / Men consult chart / Boy presses button / Girl touches equipment. 1960s: Construction worker on house construction site carries wheelbarrow loaded with bricks and stops. Man carries wheelbarrow down ramp. Boy watches worker who drills a hole on wooden board. 1970s: Man sits at table, painting small, carved, wood duck. Boy watches man painting duck. Man finishes. Hands molding clay on pottery wheel. Woman sits at pottery wheel, molding clay. A woman scrolls the smartphone and watches the news. 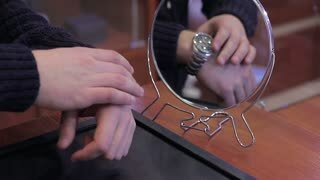 Man using his smartwatch app. Closeup. Businessman using trendy smart watches mobile application on touch screen. Guy using her smartwatch touch screen wearable technology device. Close Up. Young woman watches videos on internet in her laptop at home. She watches very concentrated and serious. Dolly shot to the right.